Of all the great new Star Wars: The Force Awakens toys and collectibles to arrive with the highest grossing film of all time, none were anywhere near as exciting as the BB-8 toy from Sphero. The adorable show-stealing droid has been given a real-life replica treatment, in the form of a remote-controlled robot you can guide with an app on your smartphone. Over the holidays, they were an impossible item on everyone’s wish list, and remain among the most popular toys on the market. 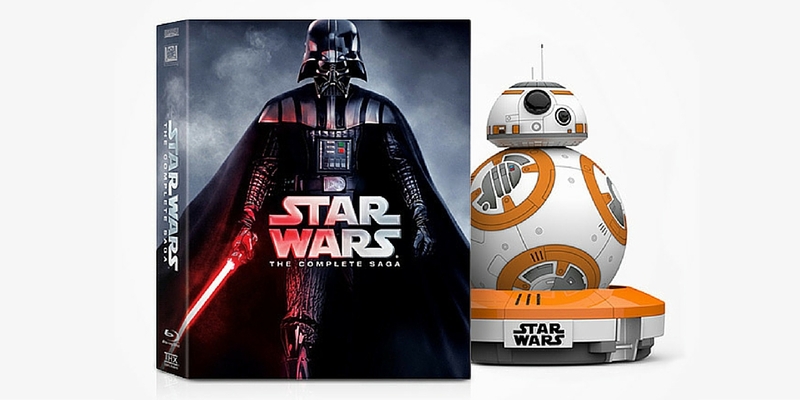 Good news, TNW readers: we’re offering you the chance to win your own BB-8 from Sphero, as well as Star Wars: The Complete Saga, the full collection of previous six Star Wars movies on Blu-ray with 40 hours of special features! The Sphero BB8 has an adaptive personality and learns as you interact. His movements and expressions change the more you use him. BB8 is more than a toy, he’s your companion. Once charged, BB-8 will operate on most surfaces in either ‘Drive’ or ‘Patrol’ modes. While Patrol mode gives it a general perimeter path, in Drive you’re in control, with the ability to move BB-8 all around, under chairs, through rooms, chasing pets and whatever other adventures you want to get into. You can even set patterns, create responses and even talk to it. If you tell BB-8 “It’s a trap!” it’ll run away in the other direction. Winning is simple – TNW readers can just head to the contest page and fill out the online entry form with a valid email address, and you’re automatically entered. Share the giveaway on Twitter, and once you get some friends to enter, you’ll receive additional entries to win. One registration per person please!